Yes, we sold our Winnebago Sightseer motorhome and are once again truly homeless. Let me explain. In late January of this year we knew that in early February we were going to Tahoe for about 3 weeks and then after returning we would be leaving for Europe shortly after that, returning in early June. Therefore, we would need to store our motorhome for about 5 months. 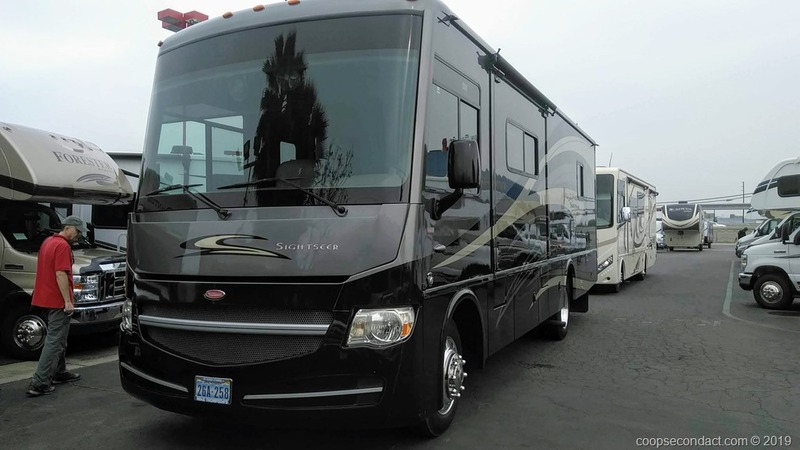 Now, obviously, that alone is not enough to justify selling the motorhome but, in the past few months we have been thinking that if we were going to continue some form of RV life (and we feel pretty sure we will) then we might prefer to make a change from the Sightseer. Certainly this does not mean that we were unhappy with the Winnebago. We have really enjoyed the four years that we spent traveling in our motorhome. It took us cross country, as far as Acadia National Park in Maine and to the Florida Keys. Plus we traveled extensively throughout all of the western states and into British Columbia. All together about 25,000 miles driven, visiting 38 states. It was comfortable and reliable. Sure we had a few items that needed repair along the way but that is not unexpected. The primary issue we had with the Sightseer was the space given to the kitchen, both counter space and pantry space. Valerie likes to cook and she stocks a big variety of different food items needed to support her experiments with creative new vegan dishes. As a result we had food items stashed in multiple locations since the Sightseer had limited pantry space. Also, if we tried to work together on something in the kitchen we had to compete for the limited workspace. So the bottom line was, if we were convinced that we wanted to change to a different RV then it made no sense to store the Winnebago for 5 months and then make a change. Then there were a few additional factors: 1) the registration will come due in late April, (2) the extended warranty will expire in late April and, (3) the tires will soon need to be replaced at a cost of $3,000 – $3,500. Once we got our heads around the situation, our decision was to sell and since we were in no position to take the time needed to attempt a private party sale, we sold directly to a dealer. So on January 30, we delivered it to the dealer and concluded the sale. Once we get back from Europe we will assess our situation and determine our path forward. It is yet another chapter in our Second Act (retirement) journey. Chapter 1 was a period of about 5 years consisting mostly of travel in Central and South America and one trip to Europe, a few domestic road trips and occasional housesitting. Chapter 2 has been 4 years of travel and living in the motorhome. Now it’s time for Chapter 3.